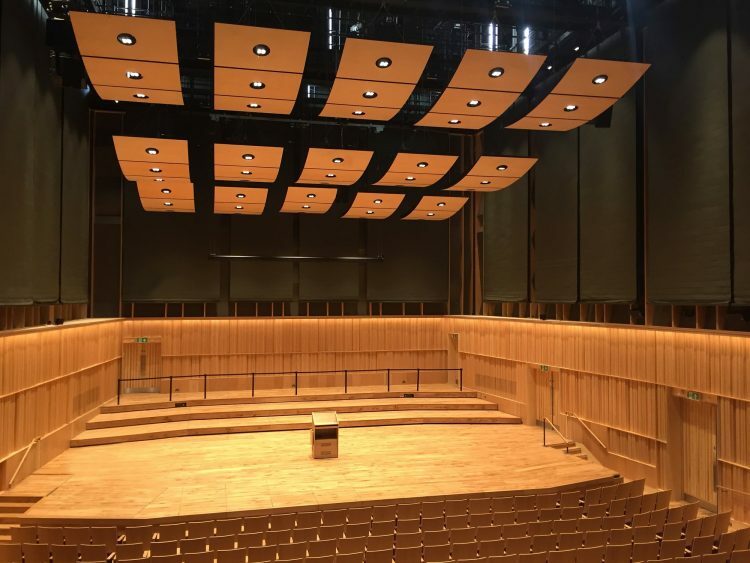 In one of the company’s biggest ever projects in the UK, J&C Joel, helped keep sound in check by installing their acoustic solutions in the Royal Birmingham Conservatoire’s performance spaces. For the multifaceted project J&C Joel provided an array of stage engineering and acoustic solutions for The Concert Hall. This included 24 acoustic concertina banners, rolling beams, moving stage, temporary demountable forestage and an acoustic reflector rigging system. One of the most important aspects of the job was the acoustic properties in the performance spaces. To improve the acoustics in The Concert Hall, 24 acoustic concertina banners were installed ranging in size from 2.2m wide to 4.5m wide. The banners were manufactured by the in-house fabrication team to meet the acoustician’s specification with dual lined premium wool serge, which was custom dyed and mounted on aluminium slats to provide additional sound absorption to the walls of the room when lower reverberation times were required. Each was independently controlled via a master control system, so each blind could be operated on demand to create variable height, or selected to move all 24 at once. Six x 500kg Chain hoists, three x 600kg pilewind hoists and five x 500kg steel band hoists were also supplied and installed with a centralised rack-mounted control system, enabling individual and grouped control of different axes from a variety of positions at walkway and concert platform level via a digital controller. 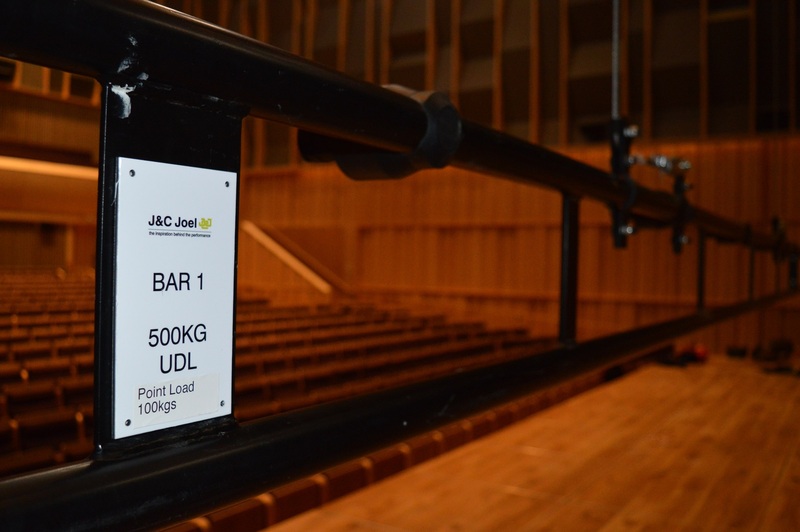 J&C Joel’s project engineers also installed 12 travelling beams and beam trolleys with chain hoists in The Concert Hall for a flexible rigging system these had a safe working load of 500kg per point. Over the concert platform three motorised, fixed speed, cross-stage bars with a safe working load of 500kg per bar were supplied for the suspension of platform lighting and other equipment. The company also provided stage engineering for 15 variable acoustic reflectors which consisted of 30-bespoke mounted D8+ manual steel wire rope winches and associated rigging. An orchestral rolling riser was installed at the rear of the stage which measured 15m wide and 7.5m deep, which can be deployed as required to raise the rear of the stage and provide more space for concert performances. 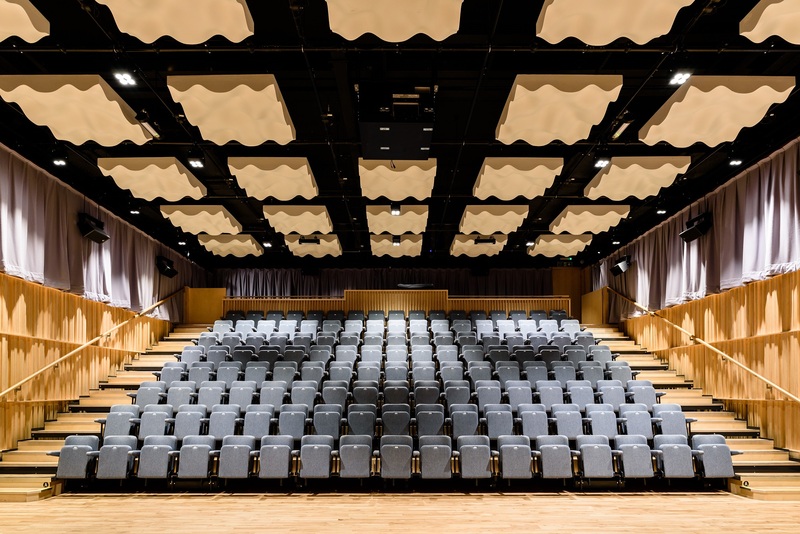 A demountable forestage was also designed, fabricated and installed measuring 2.5m by 16m wide which provided more performance space with coverage over the first two rows of auditorium seating. This had a safe working load of 5Kn per m2. The forestage was commissioned and designed to be stored under the stage in separate components. This presented challenges for the team due to the confines of space, but the team found a solution by combining latest technology with stage engineering, and creating the required load capacity and demountable structure. In The Recital Hall J&C Joel’s engineers supplied and installed perimeter track and drapes. A manual corded Erail was installed and natural Coloured Wool Serge (WS020) masking drapes were manufactured and hung from it. 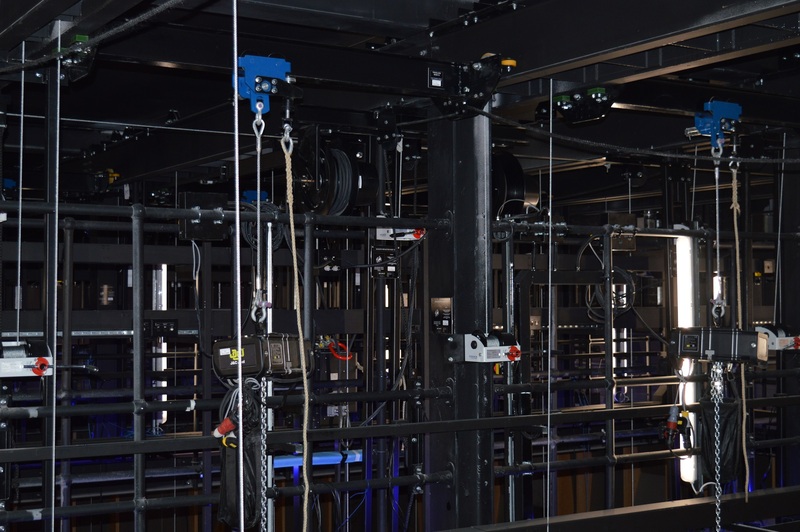 For The Lab, J&C Joel also provided and installed a system of three chain-hoist operated truss grids, comprising of 500kg chain hoists and Litec QX30SA truss this was tailored to the client’s requirements and internally wired for stage lighting and audio-visual solutions. These grids offered flexibility, and prevented the need to clear all equipment out of the hub when the grids were lowered. The grids were provided with a control system that allowed any grid to be lowered, or raised, at a time. A Unitrack was also installed on three sides of the space to provide the opportunity to hang drapes in the future if required. 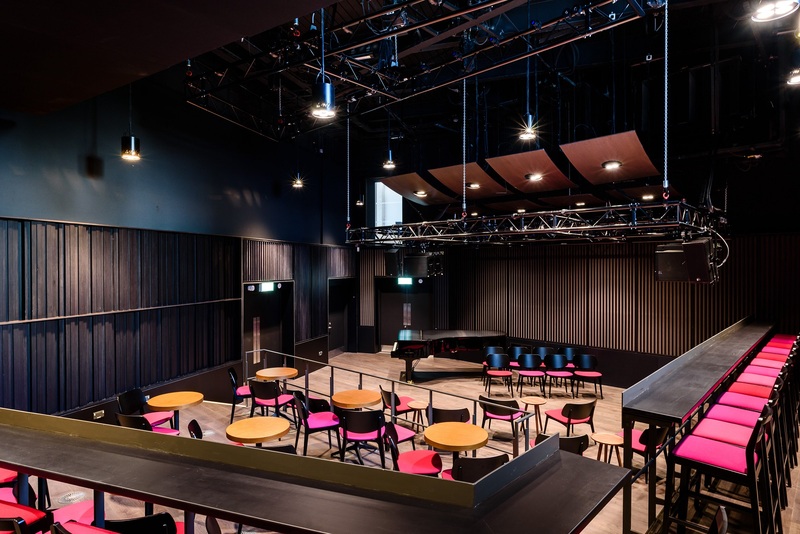 In the Eastside Jazz Club, a system of chain-hoist operated ladder bar grids was supplied and installed comprising of bespoke Litec FX30s truss which was also internally wired. The grids were provided with a control system that allowed both grids to be lowered, or raised, at a time. The main challenges were trying to install the stage engineering solutions and acoustic solutions whilst working on a construction site and trying to keep to timescales with many challenges including dust, noise and even walls being moved or built. To overcome this, we worked in tandem with the main contractor, working with their ever-changing schedule and we adapted our install time to fit in with them. Another challenge was all the elements to the 24 acoustic concertina banners as they had to be manufactured in Sowerby Bridge then transported to Birmingham. Some of the banners were up to 5m long so trying to get them through a construction site was challenging. The £57m Royal Birmingham Conservatoire is an international music and drama academy, which is part of Birmingham City University. It has over 500 students on undergraduate, postgraduate and research programmes, as well as a junior department of over 200 students. In 2015, renowned cellist and conductor Julian Lloyd Webber was named as Principal. 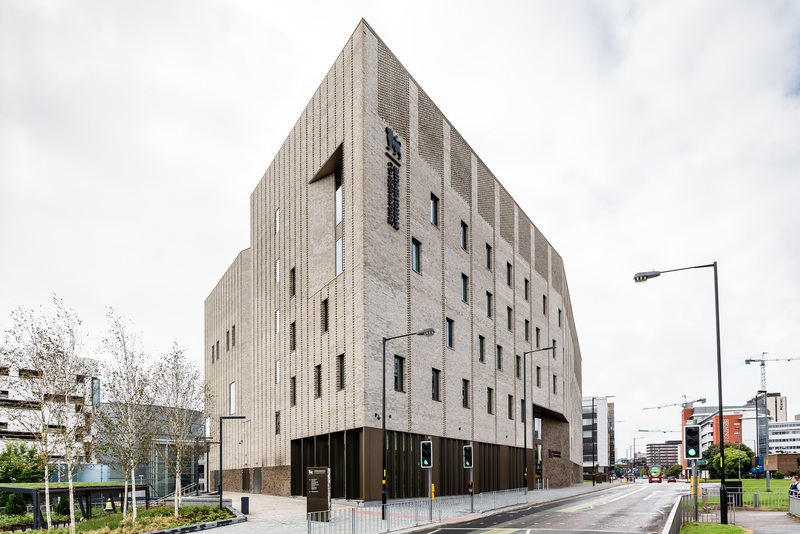 The Conservatoire has moved to a new building adjacent to Millennium Point, where Birmingham City University already has a campus. The new building includes The Concert Hall – a 500-seat concert hall with a large stage, to accommodate a symphony orchestra. 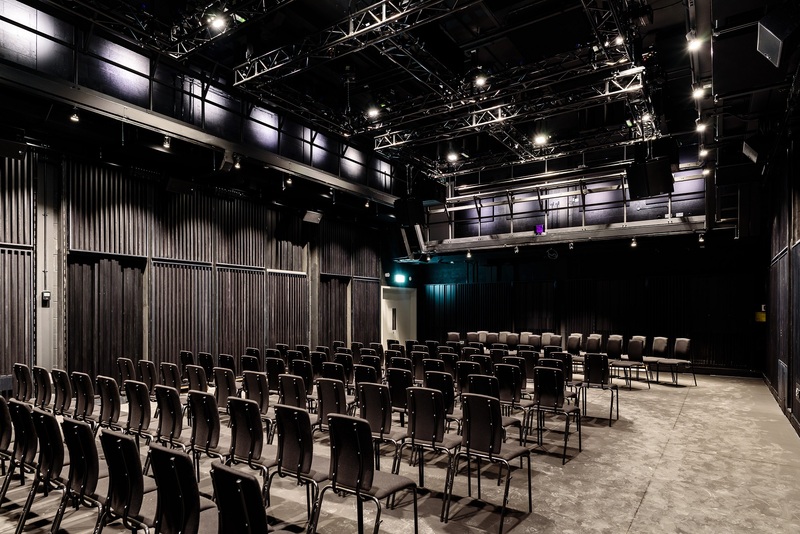 Other venues include The Recital Hall with retractable seating, The Lab, a cutting edge, completely flexible black-box studio, and Eastside Jazz Club, the first permanent jazz space in any UK conservatoire.